Friction is the enemy of braking smoothness and effectiveness. To this end, Shimano has developed their Dura Ace Polymer Coated Brake Cable for ultra-sick, high-performance road braking. 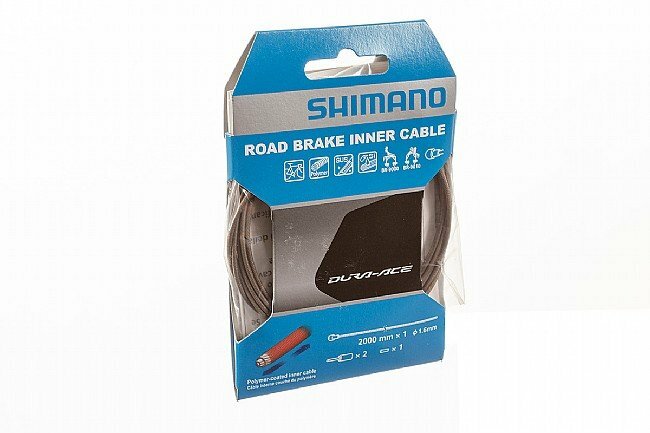 Note: Shimano ONLY approves the polymer coated cables for use with 9000 and 6800 series plus newer brakes with stronger cable fixing bolts. The fuzz is more unsightly than a function issue. The most recent cable I bought hasn't had the polymer coating do this yet. The shifter cable is another story (and review) but it drastically affects shifting and not in a good way. The Shimano cables at any level (for shifting) are short-lived and need replaced often. There are cheaper and better brake and shifter cables available. I won't use either again.